On the way to church this last sunday, my wife spotted a beautiful little Japanese persimmon tree by the side of the road. Since we were running late, we remembered the spot and came back to it on the way home so I could take a photo. That's about the size they normally grow. Japanese persimmons are not large trees, unlike their American counterparts. Check out the great wavy shape - it's really a pretty growth pattern. They always remind me of Japanese ink paintings. This particular tree looks like an astringent Hachiya type, judging by the large acorn-shaped fruits. 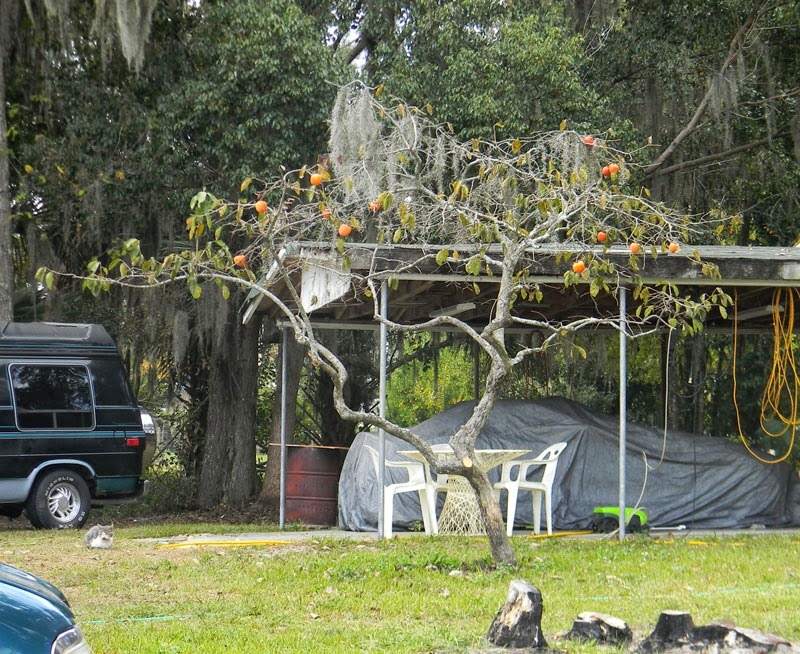 I just thought it was great to see a bearing fruit tree in someone's front yard. Whoever you are, nice work. Enjoy your fruit. Nice! I found a persimmon tree this year but haven't tried anything with it yet. I was at the library yesterday and took a photo of an old recipe that was Persimmon Pudding. Should be interesting. They're marvelous, provided you pick them at the right time and let them fully ripen. Rich and sugary. Persimmon pudding was a standard dessert every Thanksgiving growing up in Indiana. Serve topped with vanilla ice cream. You will like it. Haha, I just read this recipe the other day. It's for roasted persimmon and ginger custard. Looks fantastic!